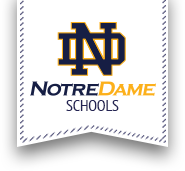 Notre Dame Junior/Senior High School is a unique community that combines academic and spiritual development. The environment includes the following characteristics that are desirable for life: trust, truth, active listening and respect. Our curriculum which meets the requirements of the New York State Regents and the Diocese of Syracuse is designed to strengthen academic competencies in all students. Our goal is to develop the unique gifts and talents of each student and to assist each student in the achievement of his or her full potential. Special emphasis is placed on the teaching of moral values, effective oral and written communication skills, critical thinking, and creative problem-solving. A variety of educational techniques that include lecture, discussion, of all students are met. Faith development and sharing are encouraged in daily religion classes, school-wide liturgies and prayer services, and retreat opportunities. Campus ministry activities support parish and community volunteer experiences that promote student awareness of Gospel values that require a commitment to serve others.